I have this idea nagging me for a while about how to make our ambassadors live (and mine) easier. 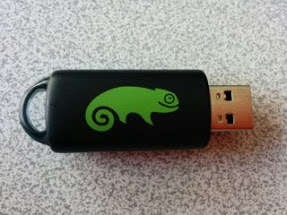 From time to time you need a flash drive with Live version of our favorite openSUSE to show it to people. Currently it is really simple to create one using dd. But once you do it, you cannot use flash drive for “normal” purposes. People somehow doesn’t appreciate flash drive that doesn’t contain vfat. So this project is about redoing openSUSE flash drive to make it way cooler and more usable. There are two projects out there that inspired me (or that I want to copy). It’s Slax live distribution and SystemRescueCD. Both are great and I would like to pinpoint some of the goals that project should reach. First of all, whole flash drive should contain vfat or ntfs or some commonly supported dumb filesystem. Nothing fancy. And everything should be just a file on that flash drive. If you need to transfer quite some data, you simple delete few directories, use flash drive as a storage and then copy those directories back. Other feature that should be implemented is to make it easily possible for flash drive to contain multiple flavors of distribution at the same time. So during the boot, you will be able to select whether you want to show Gnome or KDE. Adding new flavor should be easy – copying files with new flavor to the flash drive. Same to get rid of it – just delete Gnome flavor files and Gnome version is gone from flash drive. This is what Slax manages to do really well, although they try to combine everything into one distribution. I wouldn’t go that deep in regards to modularity for this project, but selecting which live version do you want to boot sounds like a good idea. It should be also possible to decide whether changes you make while running this Live distribution are stored permanently or lost after reboot. Now how to make it cool for Ambassadors? I think we are not rich enough to give everybody his flash drive during conference. There are two options that I would like to see integrated in this flash drive project. First, it should be possible to boot from flash drive and load everything into memory. So people can come to the booth, use flash drive to boot openSUSE, leave and play with it till reboot and we can reuse the flash drive to boot another computer. Other cool option to have would be to make it possible to to distribute this Live version over PXE, so we can have just a few ethernet cables on our booth where people can connect to boot openSUSE. Personally I would love to have something like this. And few students already shown some interest in this idea, so it might even happen. If you just decided to apply as well, feel free to submit your proposal to the melange and I have a simple homework for you (can be sent during reviewing process). My friend tried to run Live KDE over PXE few weeks ago and run into trouble that NetworkManager was messing up with network and thus his NFS root was having some serious troubles. Your homework is to solve this issue 🙂 Take an initrd from openSUSE 13.1 Live KDE and modify it so when you are booting vith NFS root, it will disable NetworkManager. Send me the result (either description or initrd or both) and the best solution (from maintainability and robustness point of view) wins.